I am living in Tamil Nadu, South India. My Aiya of 9 years, Chinnaponu, is in trouble. Her son-in-law borrowed 3 lakhs, 3,00,000 rupees, in 2014 from Family A, to pay rent and food, etc.... when he was having a dry spell in work. He is a painter. The interest was RS 30,000 rs per month. For the last 2 years they have been trying to keep up with interest payments and to date, have paid about 5 lakhs interest,, but Family A still want the principle of 3 lak. They have suspended anymore interest but want the principle paid immediately. Chinnaponu's family have no money to pay the principle. They have been assaulted, beaten, threatened with slavery and death and are constantly tortured daily by threatening phone calls from Family A. 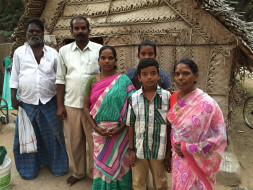 The son-in-law, daughter and the 2 children, who have had to quit school, have moved to Chennai to try to make money. Every rupee goes to pay this bill! They have come to me for help. I do not have the money., so I need help to help them! Every Dollar, Euro, Pound, Rupee, Yen, etc.. helps. Please help me help them. 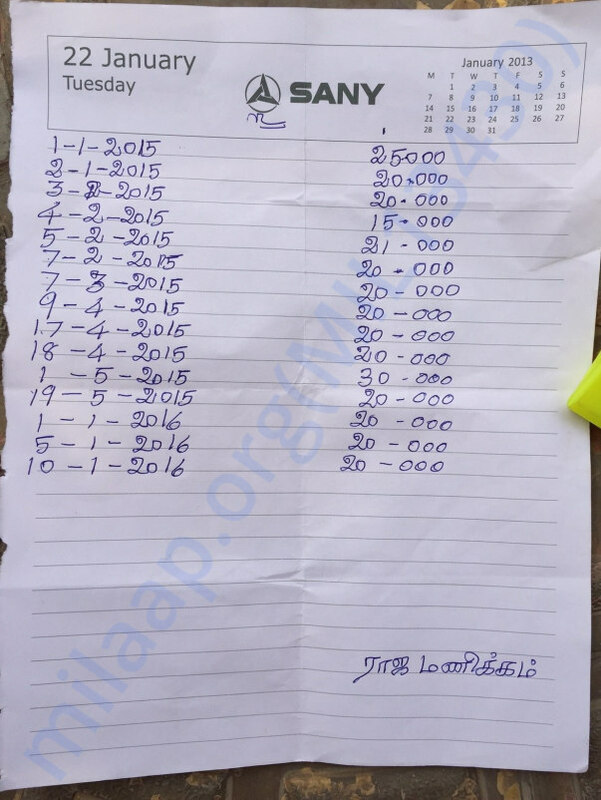 3 lakhs equals about $4,650 at today's rate. Please help this family!! Interest paid for 2015. Family A will not give amounts for 2016. IT IS DONE!!!!! The money has been paid! The family is FREE!!! It has been a long and frustrating ride, but today, June 29th, India time, all of a sudden, after sitting and waiting the whole month of June, a friend came to my house to pick-up the money, the money was exchanged and the stamp on the papers given a hole in it, which, here, means the bill is paid. The family would NOT sign any papers, but the hole and the papers returned means it is completed. Now, as far as I know, the family can return to Tiruvannamalai. 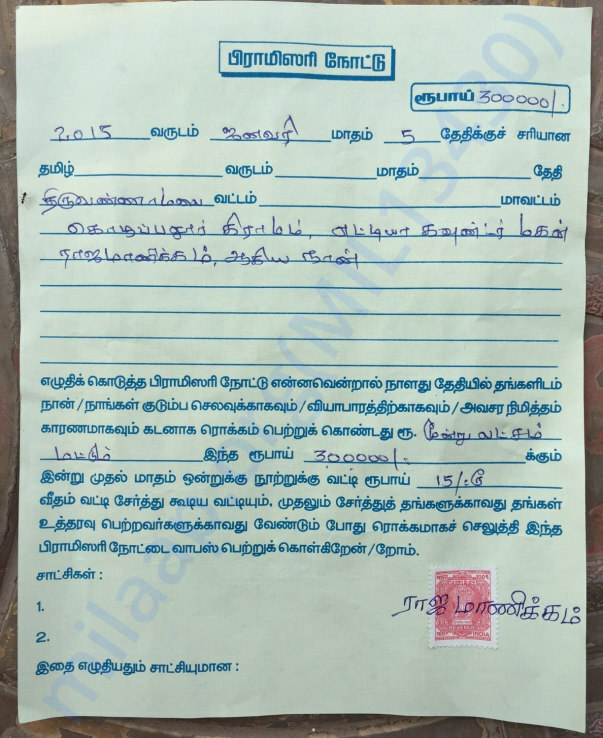 Rajamanikkam (the borrower) was so scared to come to Tiru to face the mediator and afraid of the mafia family and what they might do to him, that I had to finally call and threaten to not help them and they should never call me again their whole life!!!!! I had called so many times and so did my 3 other people helping me, but he wouldn't come. The threat worked!!!! He came, talked to the mediator and left. After coming, I guess he also, finally, called his brother to come and help! He came. All of a sudden, everyone was at the mafia house this morning and things happened very very fast. I got a call that a friend was coming over, in 5 minutes he was here, picked up the money and left. Half hour later I got a call that it was done and the papers delivered to me. My face, except for the people helping me get this done, was not seen. Amazing!! The papers were BLANK!!! Except for Rajamanikkam's, the one posted here, on this site! That meant that the mafia family could have filled in whatever they wanted, We were very worried about that when I found out there were 2 papers and not just the one which I was given. But, it worked out!!! They didn't fill in anything more. And I have all three papers. Chinnaponu, now, also, has a bank account, with about RS 6,000 left in it. She will learn how to use it and maybe they can build on it. It is not my business after turning over her card and check book to her, but I wish them the best about it. She really is very uneducated but she can print her name, which made all this work. I, again and again, want to THANK each and every one of YOU!! from the bottom of my HEART for helping make this happen and make this family FREE again. There were so many people telling me that I shouldn't have helped them, why am I getting involved, etc....... BUT, it was my Heart that helped them. And it was YOUR HEARTS that helped them. And that's what counts! It was all done with your LOVE. May you all live in PEACE, BLISS, HAPPINESS, LOVE, HEALTH, and FREEDOM!!! May you all be FREE! This is all in Arunachala's Grace. We have not completed the issue yet. It is taking longer than I ever thought, but we're moving right along. I will update you when it is finished. Again, Thank You for all the Love and Care and Donations. I am, finally, withdrawing the last amount of the contributions from Milaap. Feels good to finally get this part done. I have spoken with a person who is willing to go to the Mafia family's house and do the exchange for me. But that will be next month. We are still waiting for the Pan card and the banking issues are almost completed. I, next, have to buy Rs 20 non-Judicial Stamp paper and write the conditions of exchange on it and pray that the Mafia family signs it. Chinnaponu's husband came back to Tiruvannamalai and has been beaten up twice, so they are back in Pondy. How can people be this way? Anyway, I am looking and hoping for first week in June to complete all this. It will be good. Pray for no complications. I will keep you updated as to the conclusion. Thank you again and again for all your contributions, Love, care and help.